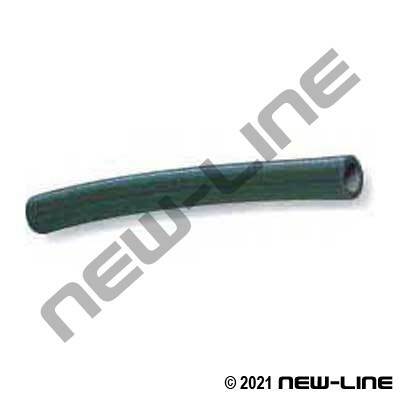 NL5050 is a high grade PVC hose with a solid colour cover for reduced algae growth and U.V. degradation in warm applications or in outdoor applications. It is similar in construction to our NL1270 Clear Reinforced PVC but is commonly used where the clear properties of NL1270 are less desirable. It is used for potable water, deionized water, or in other applications requiring high purity water - such as in semiconductor manufacturing or for municipal water main bypass. This hose has a non-marking, non-perforated cover and is non-conductive and silicone free. It meets FDA, NSF (51 & 61), and California Proposition 65 requirements. Typical Fittings: N400-BR brass, N400-SS stainless, or N400-NY nylon barbs, N505-BR garden hose fittings, brass FBL ferrules, N66 pinch clamps. Construction: Tube: Smooth, clear PVC. Cover: Smooth, solid grey (NL5050) PVC. Reinforcement: High tensile yarn.